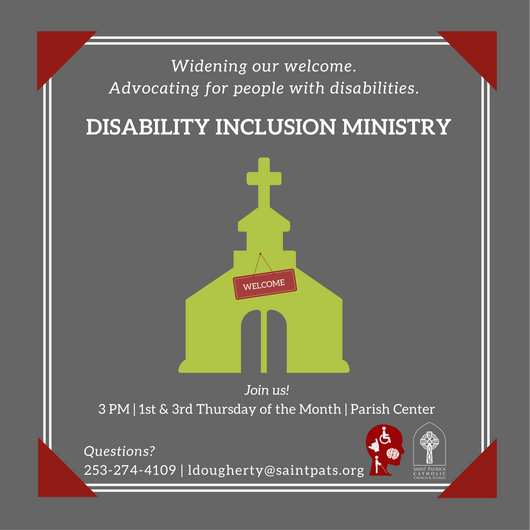 The Disability Inclusion Ministry is widening the welcome and advocating for people with disabilities. The United States Conference of Catholic Bishops encourages all parishes to include people with disabilities in all aspects of parish life. At Saint Patrick Catholic Church we are dedicated to rising to the challenge. People with disabilities make up about 20 percent of the population. Yet, 90 percent of individuals with long-term limitations don’t go to church. Those that do, often feel invisible. Individuals with disabilities don’t want pity. They need to be respected just as they are. Living one day at a time; enjoying one moment at a time; accepting hardships as the pathway to peace; taking, as Jesus did, this sinful world as it is, not as I would have it; trusting that God will make all things right if I surrender to God’s will; that I may be reasonably happy in this life and supremely happy with God forever in the next. I want to help widen the welcome!